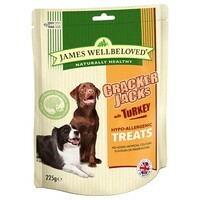 James Wellbeloved Crackerjacks are tasty, hypoallergenic dog treats that are perfect to give your dog as a reward. We believe dog treats are both healthier and tastier if they're made from pure, natural ingredients without any unhealthy additives or added sugar. So that's exactly how we make our treats. That's what makes them completely different from other treats. What's more, dogs love the way they taste. It's all down to the ingredients. Wholesome fresh turkey, rice and tomato, all seasoned with rosemary and parsley. Absolutely delicious! As with all James Wellbeloved foods, our treats are hypo-allergenic. So they contain no beef, no wheat, no gluten and no dairy products because those are the ingredients which cause most food allergies in dogs. We avoid those ingredients so your dog can avoid the allergies which could give him loose digestion and skin irritations. These are at least half the size they used to be but are still a good quality biscuit - they just get 2 now instead!